The policy debates over Social Security and Medicare are potentially cross-cutting issues for older generations. Silents, as well as many Boomers, place a high priority on these issues politically and are generally more resistant to major changes or reforms than are younger Americans. As a result, while Silents favor the GOP by wide margins on jobs and the budget deficit, they are as likely to prefer the Democrats when it comes to Social Security. 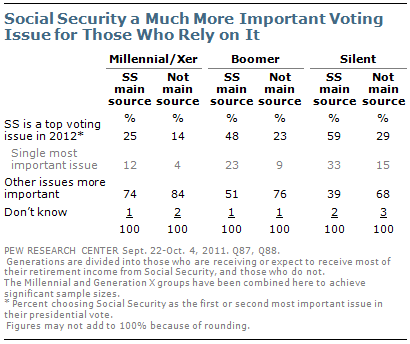 Silent and Baby Boom generation voters who are the most dependent on Social Security, and those who say it is an important issue to their vote, back Obama over Romney by significant margins. While there are sharp generational differences over entitlement policies and the importance of the issue, there is little evidence of generational resentment or friction over what government provides for seniors. Millennial voters are just as likely as Xers, Boomers and Seniors to say the government does too little, not too much, to support seniors, and young and old alike are more concerned that the programs will run out of money for benefits than about the burden maintaining current benefit levels puts on younger people. When it comes to the two core entitlement programs serving seniors in America – Social Security and Medicare – there is broad consensus regarding their value to the nation as well as the precariousness of their finances. Nearly nine-in-ten Americans say each of these programs has been good for the country over the years, and this includes at least eight-in-ten across all generations young and old. Similarly, roughly three quarters say these programs are in only fair or poor shape financially, and this view crosses generational lines as well. Where the generations differ is in their evaluations of the current effectiveness of these programs. Only members of the Silent generation – the vast majority of whom receive Social Security and Medicare – say these programs do a good job of serving the people they cover. Majorities of Millennials, Generation Xers, and Boomers say the programs do only a fair or poor job. The younger generations are more supportive of seeing the programs overhauled. 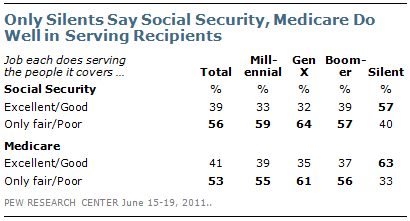 Most Millennials (56%) and Gen Xers (66%) say Social Security needs major changes or a complete overhaul. By contrast, most in the Silent generation (62%) say the system works pretty well and needs only minor changes. Boomers, many of whom are on the cusp of receiving Social Security themselves, are more divided – 45% say they think only minor changes are in order, while 50% say major changes need to be made. In keeping with their support for major changes, the vast majority of Millennials back proposals that involve some degree of privatization of Social Security and Medicare. Fully 86% of Millennials support changing the system so younger workers can invest their Social Security taxes in private retirement accounts. And 74% of Millennials favor changing Medicare so future participants can use the benefit toward purchasing private health insurance. Support for both of these ideas drops off among older generations and they garner a decidedly mixed reaction from those in the Silent generation. When it comes to proposals to gradually raise the eligibility age for these programs, there is substantially more support from those who are mostly retired than from those who are not. About half in the Silent generation favor gradually raising the Social Security retirement age and the Medicare eligibility age. Majorities across all younger generations oppose these ideas. A third area of proposed entitlement changes – means-testing benefits to reduce what high income seniors receive – divide the country, but not along generational lines. About half (53%) of Americans favor reducing Social Security benefits for seniors with higher incomes as a way to address financial problems with the system, and there is no difference in levels of support across generational lines. Similarly, 55% of the public, including nearly identical percentages across generations, favor reducing Medicare benefits for higher-income seniors. Generally, the public is resistant to any cuts in entitlement benefits in order to reduce the budget deficit or reduce the tax burden. 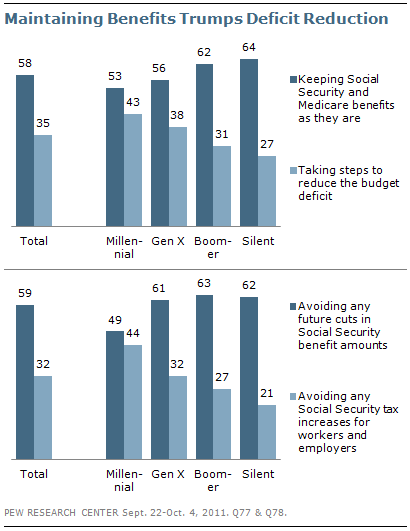 By 58% to 35%, most say keeping entitlement benefits as they are is more important than reducing the budget deficit. And by an almost identical 59% to 32% margin, more say that higher priority should be placed on avoiding future Social Security benefit cuts than on avoiding any Social Security tax increases for workers and employers. Resistance to benefit cuts increases across generations, with both Boomers and Silents siding with preserving entitlement benefits by at least two-to-one. By contrast, Millennials are more divided on both of these questions. One factor strongly related to attitudes about entitlements is people’s reliance – or expected reliance – on these programs. 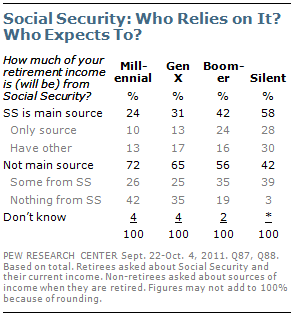 A majority of retired adults (56%) say that Social Security is their main source of income. But among those who are not yet retired, two-thirds (65%) say Social Security will not be their main source of income in retirement, while only a 32% minority say that it will. When probed further, nearly a third (31%) of non-retired adults think they will end up getting no money from Social Security in their retirement. Not surprisingly, experiences with and expectations about Social Security vary significantly across generations. Among those in the Silent generation – 84% of whom are retired – 58% cite Social Security as their main source of retirement income. Among these, 28% say it is (or will be) their only source of income in retirement, while 30% have other sources to supplement Social Security. Millennials, currently ages 18 to 30, have starkly different expectations. More than seven-in-ten (72%) Millennials do not expect Social Security to be their main source of retirement income. In fact, 42% of Millennials think they will get no retirement income from Social Security at all, as do 35% of Generation Xers (currently ages 31 to 46). While around one-in-five Baby Boomers (22%) say they are already retired, most are not, and their expectations about Social Security are mixed. Fewer than half (42%) of Boomers say that Social Security is or will be their main source of income in retirement, with about a quarter (24%) saying it is or will be their only source of income. A majority (56%) says they will have other sources of income that are more important during retirement, though most of these (35% of all Boomers) say they expect to get at least some income from Social Security to supplement their other sources. People’s dependence, or expected dependence, on Social Security has a significant effect on their attitudes about Social Security policy. In particular, those who say Social Security is or will be their main source of income in retirement overwhelmingly favor maintaining entitlement benefits over deficit reduction as the bigger policy priority. This is particularly true among those in the Silent generation, who have mostly retired already, but also true among Boomers and younger people as well. Similarly, those who are counting on Social Security as their own primary income source are far more opposed to raising the retirement age for Social Security eligibility. 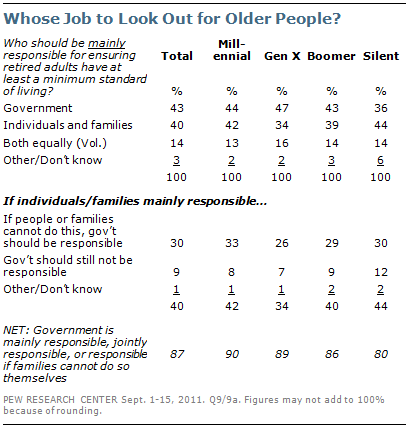 The link between personal need and views on this issue is notably strong among Baby Boomers. Boomers who say Social Security is or will be their main source of income oppose raising the retirement age by more than two-to-one (69% oppose, 29% favor) while Boomers who say other sources of income will be more important are divided (52% oppose, 47% favor). 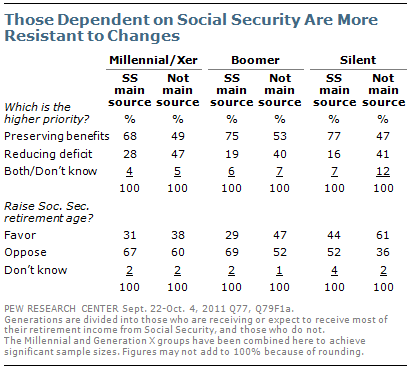 Social Security trails well behind the job situation, the budget deficit, and health care as key voting issues in 2012. 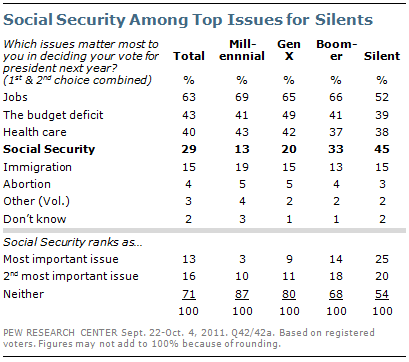 But it is clearly among the top issues for older voters – 45% of Silent generation voters cite Social Security as the most important (25%) or second most important (20%) issue to their vote – rivaling the 52% who say jobs, and slightly more than the percentages citing the budget deficit (39%) or health care (38%) as a top voting issue. Among Baby Boomers, the job situation outranks Social Security as a top voting issue by two-to-one (66% to 33%), and the gap is even wider among Millennials and Generation Xers. Financial reliance on Social Security is strongly linked to the importance of the issue to voters. Within the Silent generation, 59% of those who get most of their income from Social Security say it is a top voting issue, compared with just 29% of those who say it is not a main source. The difference is nearly as large among Boomers – 48% of those who receive or expect to receive most of their retirement income from Social Security rate it as a top voting issue, compared with 23% of Boomers who get most of their income elsewhere. Not only is Social Security a higher priority for Silent voters, it is a significantly bigger factor shaping voting preferences among Silents than among younger generations. Among all Silents, Mitt Romney holds a 13-point lead (54% to 41%) over Barack Obama. But among the half of Silent voters who rate Social Security as their first or second most important issue, Obama leads by 10 points (51% vs. 41%). 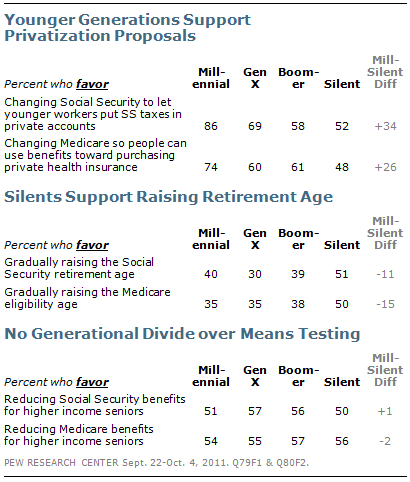 Silent generation voters who do not prioritize Social Security favor Romney by two-to-one (64% to 32%). 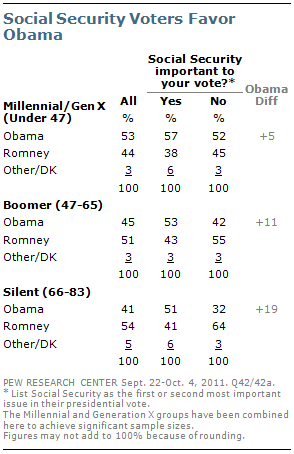 The gap is somewhat narrower among Boomers: Those who say Social Security is important to their vote favor Obama by 10 points, while Boomers who do not favor Romney by 13 points. Because just a third of Boomers cite Social Security as a top voting issue, Romney holds a modest six-point lead (51% to 45%) among all voters in this cohort. These gaps reflect the fact that those who prioritize Social Security tend to favor keeping the program unchanged, and tend to be more reliant on the programs, meaning they are typically from lower income households. 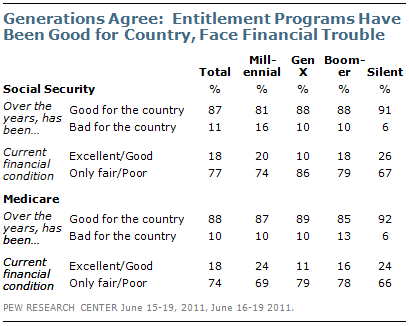 Across generations, there is broad agreement that the entitlement programs are not on sound financial footing. And there is considerable concern – again, among young and old alike – that in the future there may not be enough money to provide Social Security and Medicare benefits at their current levels. By contrast, the possibility that keeping these benefits at their current levels may put too much of a financial burden on younger generations is less of a concern – even among young generations themselves. Majorities of Gen Xers (70%) and Millennials (57%) say they are very concerned that financial shortfalls in Social Security and Medicare may lead to reduced benefits. Fewer Gen Xers (45%) and Millennials (41%) are very concerned that maintaining current benefits may excessively burden young people. 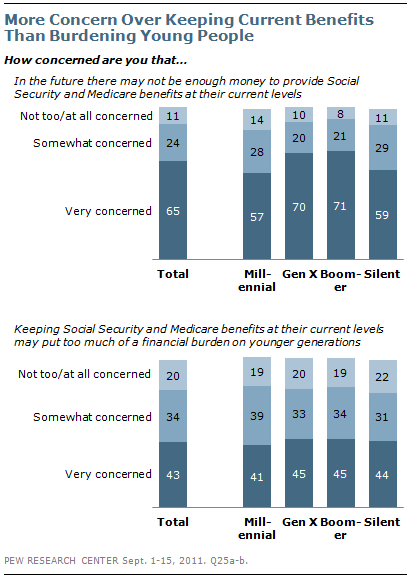 In this regard, Gen Xers and Millennials are in synch with Boomers and Silents; among both groups, more are very concerned about possible benefit reductions than by the possibility than keeping benefits at current levels may place too much burden on younger generations. Majorities of the public say the federal government does not do enough for older people (60%), the middle class (58%), poor people (57%) and children (57%). 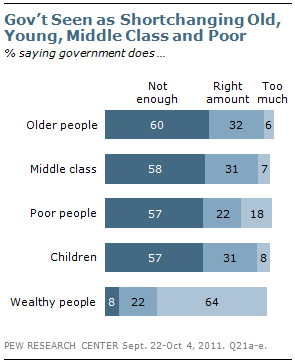 On the other hand, nearly two thirds (64%) say the government does too much for wealthy people. More than half of each generation agrees that the government does not do enough for older people, including 64% among Baby Boomers and those in Generation X. The numbers saying this are slightly lower among the youngest and the oldest generations: 55% of Millennials and 52% of Silents say the government does not do enough for the elderly. Notably, majorities of Democrats (69%), Republicans (52%) and independents (56%) say the federal government does not do enough for older people. In addition to their agreement that the government does too little for the elderly, the youngest and the oldest generations both say the government does too much for the wealthy (62% and 63%, respectively). Similar majorities of Gen Xers (66%) and Baby Boomers (68%) say this as well. Substantial majorities of Democrats (76%) and independents (66%) say the government does too much for the wealthy; only about half of Republicans (49%) agree. 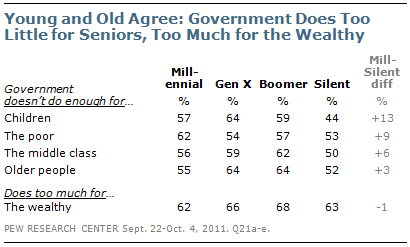 The Silent generation is least likely to say the government does not do enough for children. Just more than four-in-ten (44%) say this, compared with 64% of Gen Xers, 59% of Baby Boomers and 57% of Millennials. On the other hand, the youngest generation is most likely to say that the government does not do enough for the poor: 62% of Millennials express this view, compared with 53% of the Silent generation. Nearly six-in-ten Boomers agree (57%), as well as 54% of those in Gen X. The public is divided over whether the government or individuals and their families should be mainly responsible for making sure that retired older adults have at least a minimum standard of living. The differences among generations on this question are relatively small. Looking at the public as a whole, about four-in-ten (43%) say the government is mainly responsible for ensuring at least a minimal standard of living for older people, while 40% say individuals and their families are mostly responsible. More than one-in-ten (14%) volunteer that both are equally responsible. Millennials and Boomers are nearly evenly divided. The balance among Gen Xers tilts toward the government (47% vs. 34%), while the Silents tilt slightly more toward individual responsibility (44% vs. 36%). On this question, the divides are greater across income levels than the generations. Among those with household incomes of $75,000 or more, 51% say individuals should be mainly responsible for making sure older adults getting a basic level of care, while 33% say the government should be. The numbers are reversed among those with household incomes of less than $30,000 (53% say the government should be mainly responsible, 29% say individuals and their families.) Those with incomes between $30,000 and $74,999 are evenly divided (42% each). When those who say that individuals are mainly responsible are questioned further about whether the government should be responsible if individuals fall short, most agree that the government should be the ultimate backstop. Substantial majorities across all generations say the government should be mainly or partly responsible for ensuring that retired people have a minimum standard of living.